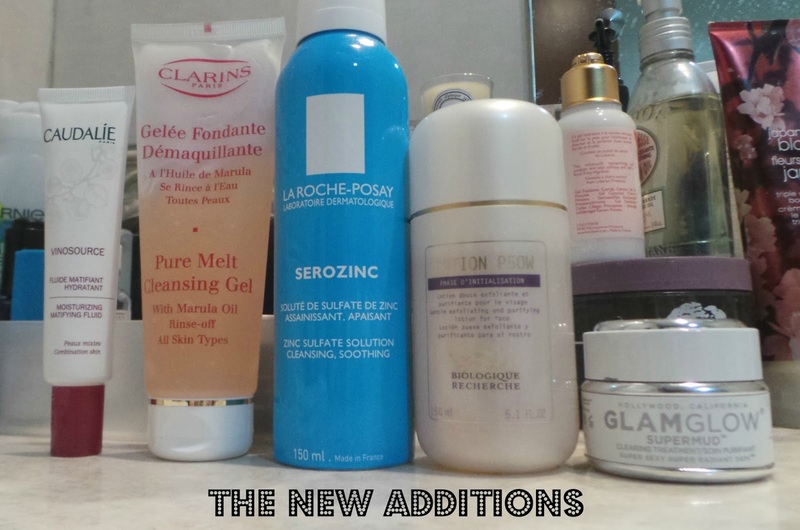 This 'new additions' post is all about skincare. My skincare routine has had a little re-shuffle recently and *touch wood* seems to be working. First up is the Caudalie Moisturising Mattifying Fluid. When I was in the UK over Xmas my skin was constantly breaking out round my chin and had been for a couple of weeks. I quite frequently switch up my skincare and I finally pinned down that it was the Kate Somerville Goats Milk Cream that was causing the breakouts. It was making me really miserable and I didn't have another moisturiser with me, so on Boxing Day, out of sheer desperation I ordered the Caudalie moisturising sorbet which I had used before from Look Fantastic and threw this into my online basket too. I was really impressed with Look Fantastic by the way-I ordered on Boxing Day and it arrived first thing the next morning. This moisturiser is very light and absorbs quickly. It does mattify the skin and will be great in the summer months in Dubai when the weather is so hot and humid. My skin cleared up in days as well after I started using this. I am really pleased with it. The packaging is great for not over dispensing the product and keeping it hygienically sealed. 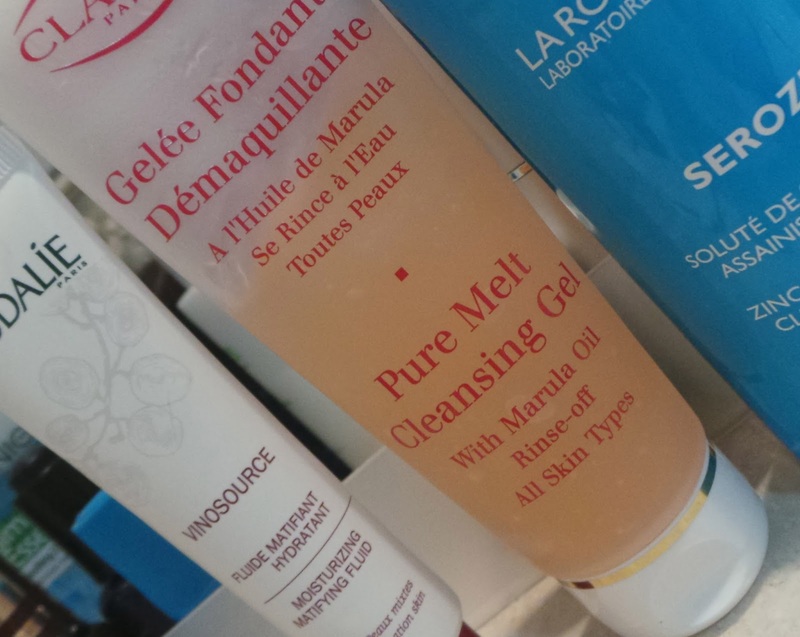 Next up is the Clarins Pure Melt Cleansing Gel. I have probably had this in my skincare stash for almost a year but something (and I really don't know what) was putting me off trying it. Until Rebecca from Be Beautiful reviewed it. If she liked it I knew I would too so I opened it up straight away when my Clinique Take The Day Off balm ran out. God I love this cleanser!!! Why oh why did I take so long to try it!! It fits into my skincare routine as my first 'make up removing' evening cleanse. I apply the gel to dry skin, massaging it in. It turns into an oil on contact with the skin and then a milk when you rinse it. I also go over my face with a wet flannel as well-I think if you don't you can feel like you have a residue left on your skin. It smells amazing, so light and fruity and does a great job removing make up. I have had no breakouts and can see me buying this over and over again. It doesn't strip or dry out the skin and I find my skin feels really soft and nourished after using it. It makes a nice alternative from cleansing balms and I really really enjoy using it. I am so glad Rebecca reviewed it or else it would still be sitting unloved in my skincare stash. Next up is Serozinc. This is my 3rd tin of this toner and I use it twice a day as my 'hydrating' toner after using my 'exfoliating toner'. It's has a very fine spray which you spritz over your face after cleansing (close your mouth-it does not taste nice!). It's a simple concoction of Zinc Sulphate, water and sodium chloride which is soothing, hydrating and antibacterial and it feels lovely and cooling on the skin. It dries quickly and causes zero irritation (if does say you can also use it on razor burn and nappy rash). I have two more as a back up. You still cannot buy this in the UK or Dubai-I have ordered all of mine from French online pharmacy Le Guide Sante. It's less than £5 and postage was really fast from them to the UK. Next up is the exfoliating toner which replaced the Michael Todd Organic Lemon Toner. It's the much hyped and stupidly expensive Biologique Recherche Lotion P50. I picked this up in Liberty in London in September (who were the only UK stockist but I read recently they have stopped stocking it) and this is the new formula, not the Caroline Hirons raved about formula, which contained 'phenol' which has since been banned-and that is the ingredient Caroline really raved about. There are now 3 versions of the P50-P50, P50v and P50w. I have the P50w which is the mildest version of the toner and claims to gently exfoliate and balance the epidermis. It doesn't sting or smell particularly strong and is as good as the Michael Todd and the La Roche Posay exfoliating toners-but it's not better. And for the price of £52 (ouch) it should be amazing. It does leave my skin clear and soft but I haven't been blown away. So if you're a big fan of Caroline Hirons you can skip this entire next paragraph but if you're relatively new to skincare and thinking 'why do you use two toners and what the hell is a hydrating toner and an exfoliating toner' then here is my (non expert) explanation. So in came toners with actual skincare benefits. And they broadly fall into 2 categories-exfoliating and hydrating. Exfoliating should be used first, followed by hydrating. Exfoliating should be swept over the skin with a cotton pad. Hydrating should be (ideally, according to Caroline) be spritzed on (I tweeted and asked, she replied) or if that's not possible, applied with a cotton pad. Exfoliating toners contain AHA's. They are naturally occuring fruit acids. They exfoliate your skin by removing the top layers to reveal new shiny skin underneath. They add radiance. They fade old scars. They give you baby soft skin. They kick start your skin into renewing itself. They're gentler than 'grainy' facial scrubs on your skin. Hydrating toners erm hydrate the skin. They will contain ingredients like glycerin or aloe or hyaluronic acid. They keep your skin plumped, hydrated and really for your next layer of skincare. And here the lesson endeth. I am no expert but I can tell you that double toning has changed my skin for the better. And I will do it forever. NB the first few days of using a new exfoliating toner I tend to first spritz the cotton pad first with a purified water spray (like the Evian or Avene ones) to dilute the toner a little bit so I can assess how strong it is. Tingling is common with exfoliating toners but should not last more than a few seconds and will subside as your skin gets used to the toner. Finally, my last new addition is Glamglow-the white version. I raved and raved about the black version here. The white version or 'Supermud' focuses more on clearing the skin and has a whole heap of fancy ingredients such as patented Teaoxi Eucalyptus Leaf and Acnecidic-6, a blend of 6 AHA's and BHA's such as glycolic acid, salicylic acid and lactic acid for a multitude of skin benefits. It also contains charcoal and clay for deep cleansing. You can read all the fancy ingredients here. So far I have used this mask three times and again have been really pleased with the results. It doesn't feel as tingly on the skin as the Black version but it's a little harder to wash off-you definitely need a flannel to help with the removal process. I have a sneaking suspicion I could like it as much as the black version.